How do I make a new SkyDrive photo album? There are a number of ways of making a new photo album or folder in SkyDrive. Here are several of the procedures. When you are in your SkyDrive online, that is, viewing it in a browser, there is a “New folder” link above the main pane. Click it to make a new folder or album. Instantly a new folder tile will be added in the main pane. The folder name will be highlighted indicating that you can just type the folder name. Type the name you want to assign to the folder or album. This folder will initially be set to Folder type Documents. You can see that when you expand the Information section in the pane on the right. There will be a Change link there. You can change it to Photos, or you can just leave it as is. When a photo is uploaded to the folder it will change to Folder type Photos by itself. Sometimes the easiest way to add a new SkyDrive photo album is to do it as you upload photos from Live Photo Gallery. In Photo Gallery sign in to your Microsoft account (upper right). 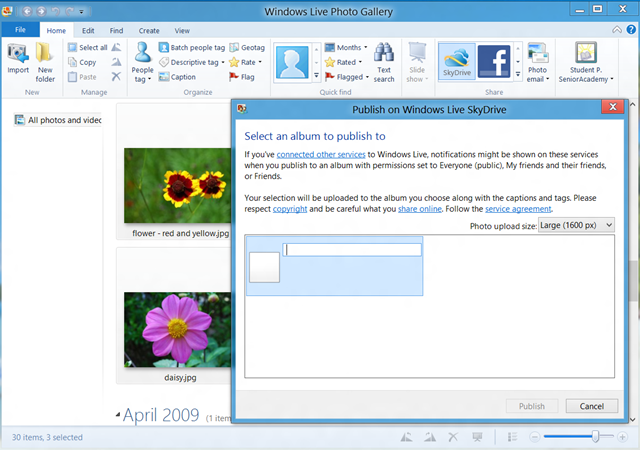 Then select the photos you wish to upload to a new SkyDrive photo album. Click SkyDrive in the Share section of the ribbon. A dialog pops up with the first option being the defining of a new SkyDrive photo album. Type in the name you wish to assign to the album and click Publish. Note the Publish button is not enabled until an album name has been typed. The SkyDrive photo album will be created and the selected photos will be uploaded to the album. If you have the SkyDrive desktop app installed you can create a new folder for photos just the way you would create any other new album using Windows Explorer. Open Windows Explorer, click SkyDrive in the left navigation pane. Then click New Folder. 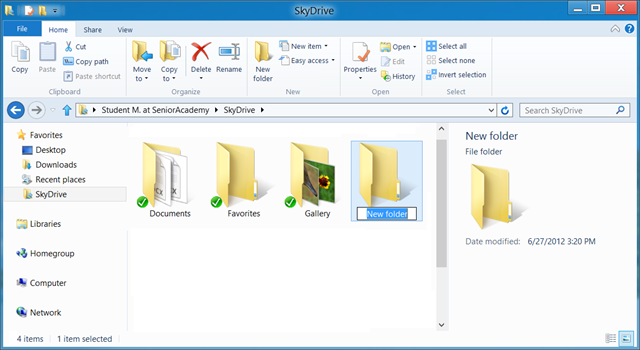 Using the SkyDrive desktop app allows you to create the new folder anywhere in the folder hierarchy in your SkyDrive. Keep in mind that you cannot upload from Photo Gallery into any sub-folders. This entry was posted in Photo Gallery, SkyDrive and tagged create SkyDrive album, create SkyDrive folder, Live Photo Gallery, SkyDrive, SkyDrive album, SkyDrive desktop app by Ludwig. Bookmark the permalink. Thanks for the info. I am using Windows 8 so am wondering if there is an app to use instead of the Live Photo Gallery program. The new version, Photo Gallery 2012, works fine on Windows 8. The “Windows 8” style Photo app is not even suitable for kindergarten kids.